We’ve got some exciting things planned for this summer! With our Jeptha Games during the Kentucky Bourbon Affair in June, our Farm to Table Dinners, and our monthly Creed Cocktails Class we’ve got some fun things in store! But we wanted to kick it up a notch! 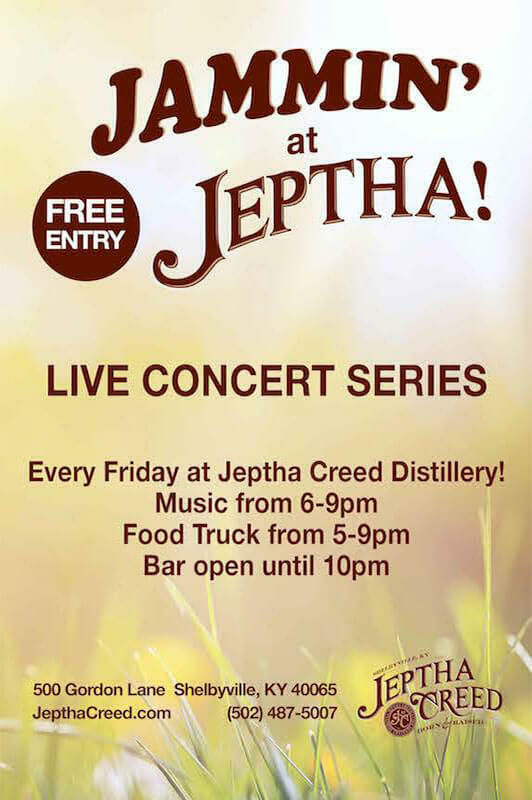 Starting Friday March 24th, we will be having a weekly concert series that we are calling Jammin’ at Jeptha! Every Friday we will have live music from, a food truck, and our bar will be open until 10pm! March 24th: Whiskey Bent Valley Boys 6-9pm, and Fresh Out The Box 5-9pm. More dates to follow. Bands will be preforming on the patio. In case of inclement weather, the concert will be moved into the Clubhouse.